Dogs Bite Decatur Al: SAN DIEGO CA - 4 PIT BULLS "SOMEHOW" GOT LOOSE AND INVADED A NEIGHBOR'S YARD KILLING UP TO 7 OF THEIR CHIHUAHUAS - NO CHARGES FILED UNLESS YOU ARE A SHERIFF'S DEPUTY OR AN ANIMAL UNCONTROL EMPLOYEE AND YOU ARE THERE TO WITNESS THE ATTACK??? SAN DIEGO CA - 4 PIT BULLS "SOMEHOW" GOT LOOSE AND INVADED A NEIGHBOR'S YARD KILLING UP TO 7 OF THEIR CHIHUAHUAS - NO CHARGES FILED UNLESS YOU ARE A SHERIFF'S DEPUTY OR AN ANIMAL UNCONTROL EMPLOYEE AND YOU ARE THERE TO WITNESS THE ATTACK??? FOUR PIT BULLS apparently got into a neighbor’s yard and killed as many as seven other dogs Saturday in the Skyline neighborhood of southeast San Diego. All of the pit bulls were turned over to animal services and euthanized after the incident. It happened at about 10:45 a.m. in the 7700 block of Jamacha Road, according to Dan DeSousa of San Diego County Animal Services. Animal Services and San Diego Police responded to a call and found that the four pit bulls had killed at least five Chihuahuas in a neighbor’s yard, with two more Chihuahuas unaccounted for, DeSousa said. The pit bulls — a two-year-old male named “Patron,” a four-year-old male named “Crunch,” an 11-month-old male named “Travieso” and a six- year-old female named “Toast” — were all turned over to Animal Services for euthanasia by their owner, 37-year-old Juan Jimenez. While animal control officers could not file criminal charges against Jimenez because they did not witness the incident, the owner of the Chihuahuas asked to press charges, and Jimenez received eight citations for the killings. The charges are considered misdemeanors, DeSousa said. This is not the first time animal services officers have been called to the residence. In 2013, animal services received a report that a dog from Jimenez’s address broke off a chain and attacked a sheriff’s deputy. In that incident, Toast and one other dog were impounded from the home and later reclaimed by their owner. There was also another complaint in 2013 of two put bulls running loose that animal services officers were unable to verify at the time. That's how my animal control is now. In the 90's, anyone could be a witness, as long as they were the age 10 or older. 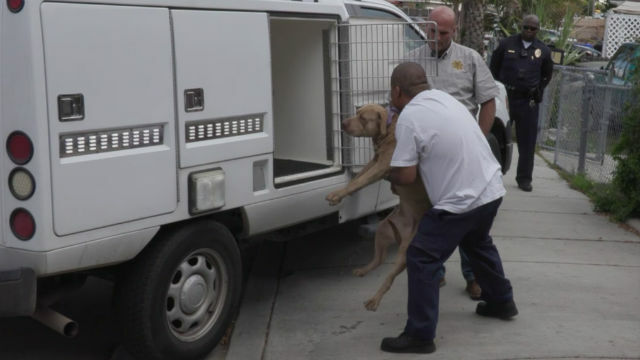 Now, only the sanctified animal control officers can be witnesses, virtually making it impossible to charge anyone with pit bulls with any kind of offense. I recently had this happen to me, after SEVERAL calls to animal control about the pit bulls that live across the street running loose. I told them I have recordings on my cell phone and surveillance cameras showing the pit bulls in my yard. That is acceptable as evidence, but they are careful not to mention that. I asked why the laws were changed, and they had no answer for me. "That was before my time, I don't know why they changed the law?" Seriously, I want to know! By that token, it's ok to go onto the pit's property and kill the pits as long as the police or AC don't witness it happening. Perfect comeback. Hope I never have to use it.